A true classic in every sense of the word, the Berkeley is another brand new addition to the Solidor family of doors and takes its inspiration from the Georgian period. The Berkeley contains two immaculately styled glazed units to help entice the natural light of the sun into your hallway. Because the design is largely solid, it will hugely appeal to those who crave enhanced privacy. You can even have it as a full solid door if you’re keen to completely obscure the inside of your entranceway from the outside world. When selecting your favourite Solidor you will be given the option of choosing between a sculptured door frame or contemporary chamfered door frame, both available in 18 different colour combinations. Each frame is manufactured from lead-free materials supplied by Kömmerling, Europe’s best PVCu extruder. You can also request the inclusion of a low threshold, each obtained from Stormguard, all of which are mobility friendly. 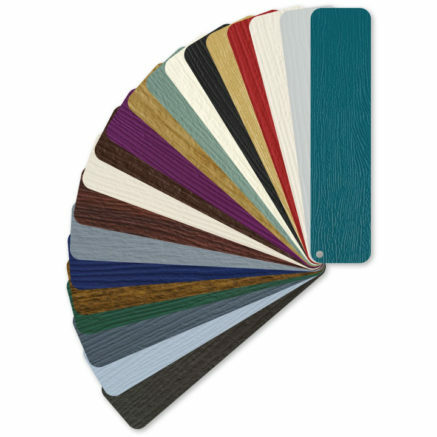 You’re blessed with choice when it comes to selecting a fashionable colour for your Solidor as we have 20 external and internal finishes available. We’re constantly developing exciting new finishes, our most recent two being Peacock Blue and Golden Sand. Mixing and matching colours may work best for your home so make sure that you explore the entire colour range before making a final decision. Whilst there is absolutely nothing wrong with having standard plain glass in your Solidor, we appreciate that some people prefer to have glass with added character. 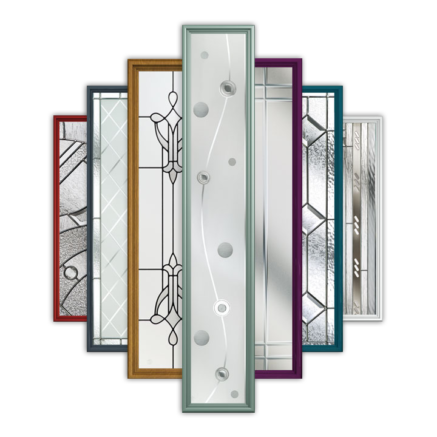 Make your Solidor even more decorative by incorporating one of our other glass options into your design. Our sparkling collection of glass options consists of bevelled, coloured, textured and many other eye-catching varieties of glass. 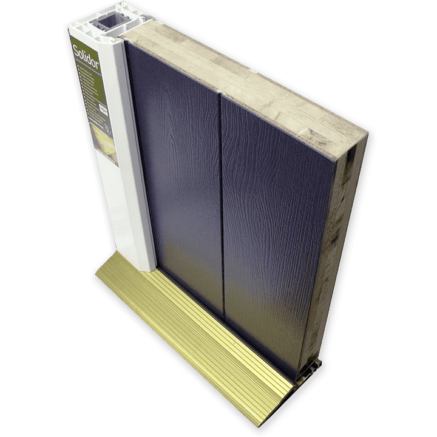 Accessorising your Berkeley door will be one of the most enjoyable aspects of purchasing a new residential door. We have an abundance of accessories including a vast selection of handles, door knockers and letter plates, each coming in finishes of black, white, new black chrome, traditional gold, contemporary chrome and modern brushed steel. 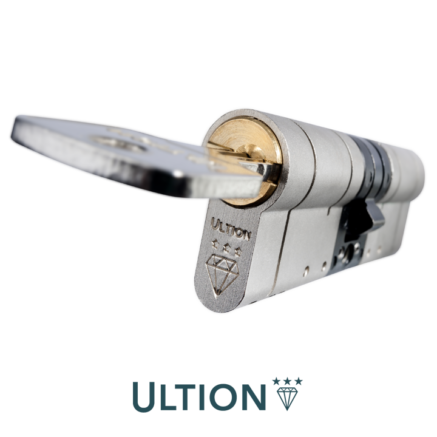 You can even determine whether your handle has a tube, flat or swept shape. 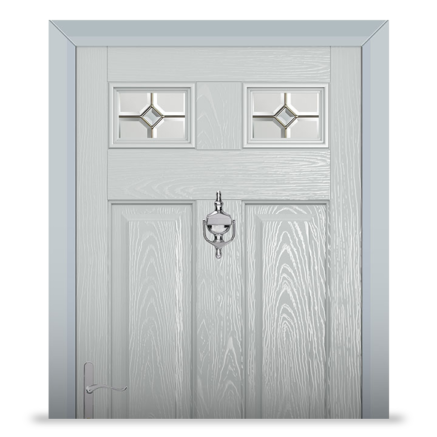 The addition of traditional ironmongery will give your Berkeley door inimitable styling. 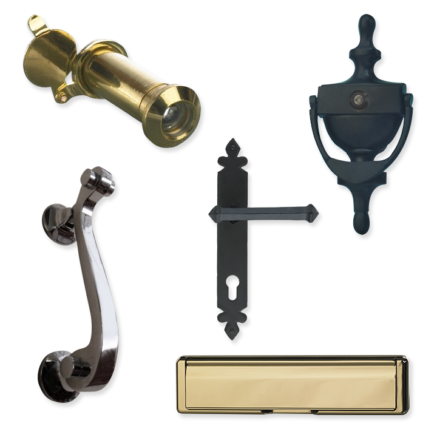 Our ironmongery range similarly includes handles, knockers and letterplates. There are 5 varieties of handle to choose from and a beautiful ring knocker, all available in black and pewter. Your favoured handle is certain to become one of the main focal points of the design and will complement it wonderfully. You won’t find another composite door that’s as solid as a Solidor! Many of the composite doors shipped into the UK from the Far East only contain foam, which offers insufficient protection and is damaging to the environment. We only ever use a 48mm thick solid timber core, manufactured from fully sustainable sources, making it a significant 10% thicker than any other composite door sold in the UK.